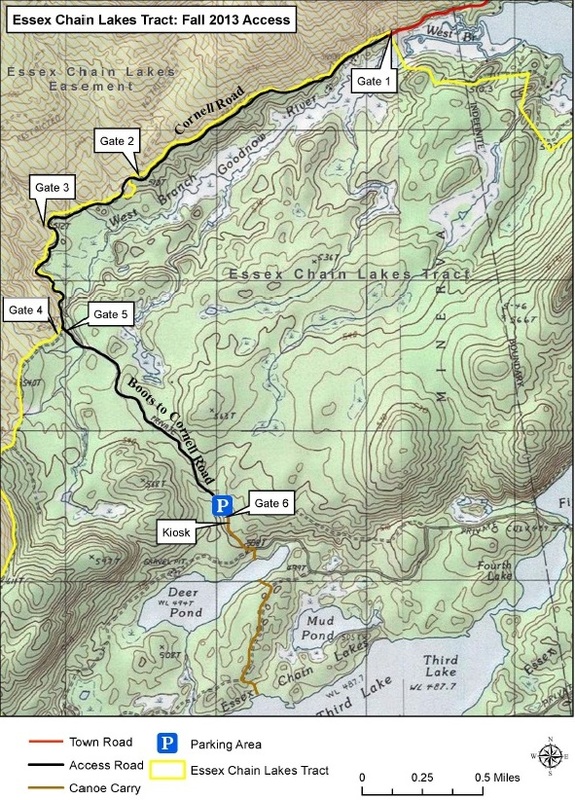 The Essex Chain Lakes Complex is comprised of the 19,600 acres of lands and waters of the Essex Chain Lakes Primitive Area located in the central portion of the Adirondack Park. 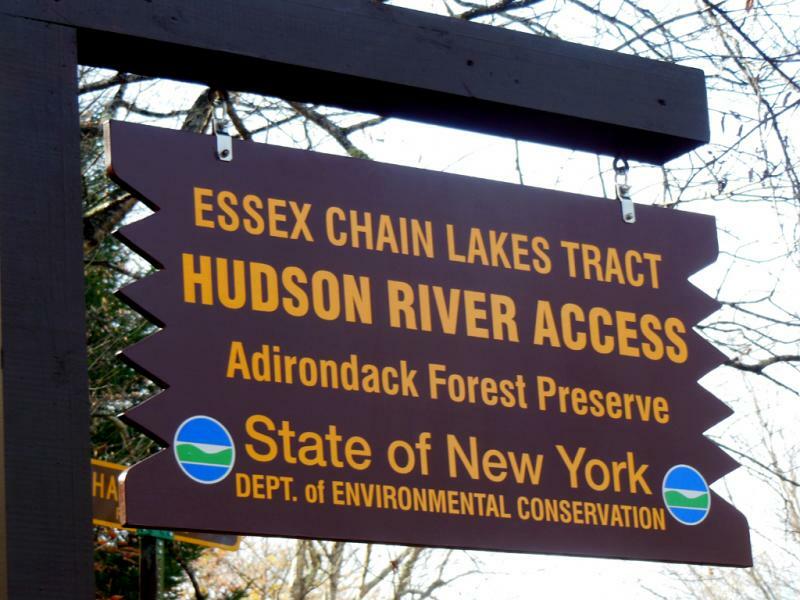 Essex Chain Lakes were acquired by the state in 2012, opened to the public officially October 2013 and made accessible for camping in June 2014. Thirteen designated tent sites along the shores of the waters of the complex require a free permit between May 15 and October 15. 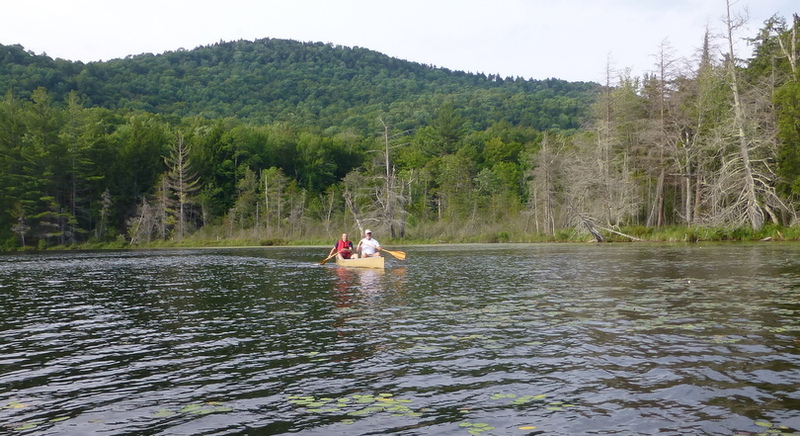 The permit system is administered through a partnership with the Student Conservation Association Back Country Stewardship Program and SUNY College of Environmental Science and Forestry’s Adirondack Interpretive Center (AIC) facility. Campers must call 518-582-2000 or visit the AIC facility at 5922 State Route 28N in Newcomb, NY, to reserve a tent site. Campers can pick up their reserved permit at the AIC facility between 9 a.m. and 7 p.m. any day of the week. Tent sites may be reserved no more than 10 days in advance. Campers may visit the AIC web site ( http://www.esf.edu/aic/ ) for maps and information about camping, the tent sites and the permit system. The AIC website will track tent sites that are occupied or reserved to assist campers in choosing a campsite. 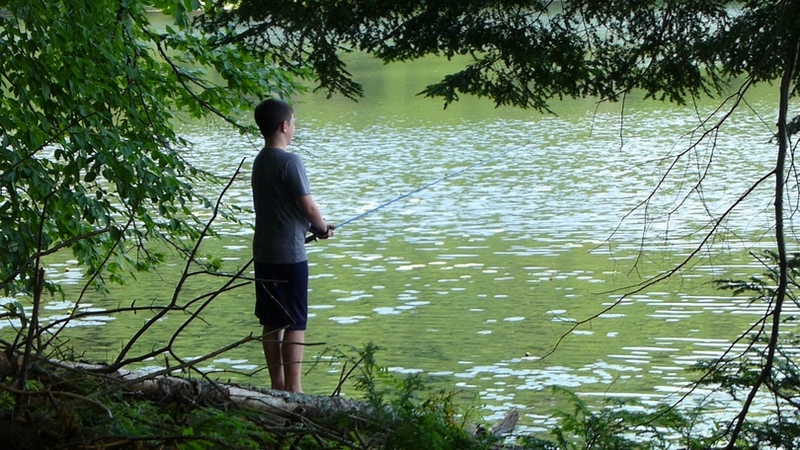 The camping is restricted — no campfires — as these campsites are located in what are the Essex Chain Lake and Pine Lakes Primitive areas. More campsites are in the works with fewer restrictions in other areas. It’s about an 11-mile drive from Rt. 28N to the Deer Pond parking lot. Take the Goodnow Flow Road approximately 4.3 miles and turn right onto Woody’s Road. Follow Woody’s Road for approximately 1.5 miles. Turn left onto the Cornell/Deer Pond Road and travel 4.4 miles to the Deer Pond parking area. The first seven miles are through private land until you reach the new Forest Preserve boundary. From there, it’s another four miles on a dirt road. A car with good clearance can make this trip under current road conditions. 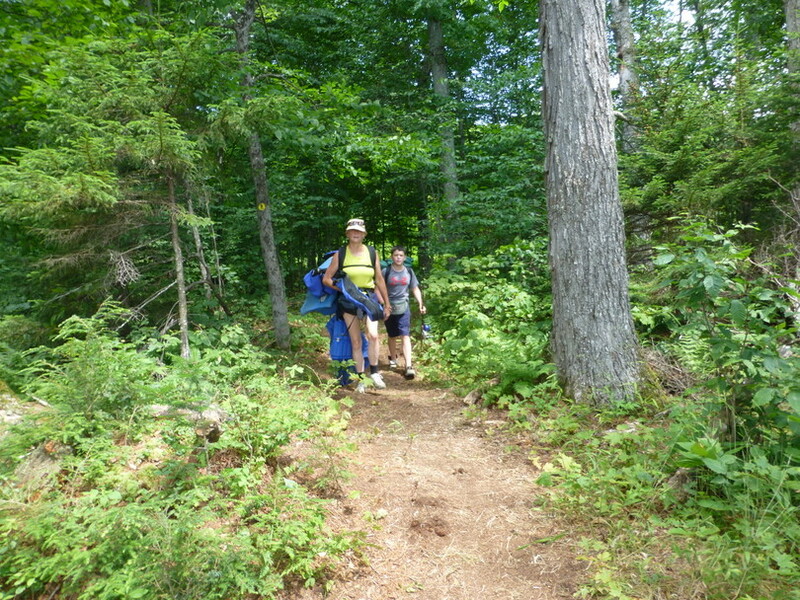 Much of the portage trail is old road which can accommodate a wheeled cart. Paddlers can carry their canoe or kayak from the parking area at the end of the Cornell/Deer Pond Road less than 0.25 mile to Deer Pond. Below Kathryn and Eric arrive at the Deer Pond launch site. 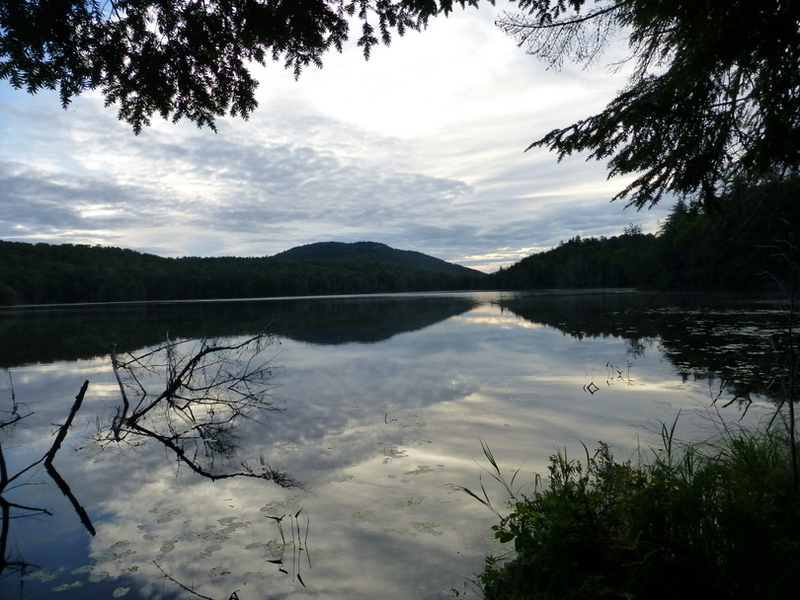 The 0.5 mile carry from Deer Pond to Third Lake is located directly across the pond on its southern shore. 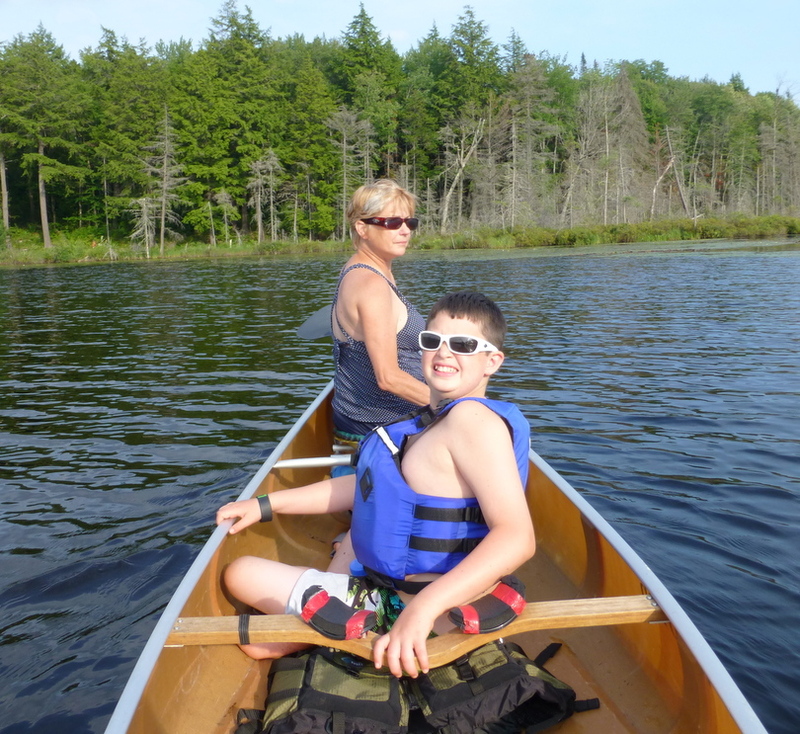 Once in Third Lake paddlers can access Second Lake by water and from there travel to First Lake using a short carry trail. 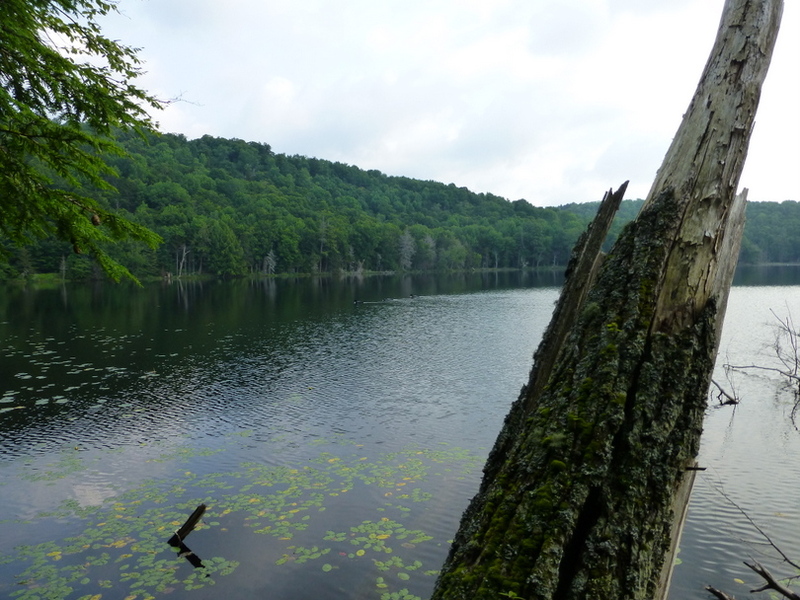 On the northern shore of First Lake near its western end is the 0.4 mile carry to Grassy Pond. We chose the other direction and traveled from Third Lake to Fourth Lake and then to Fifth Lake can be reached by paddling through the culvert under the roadway, or during high water portaging over the road. 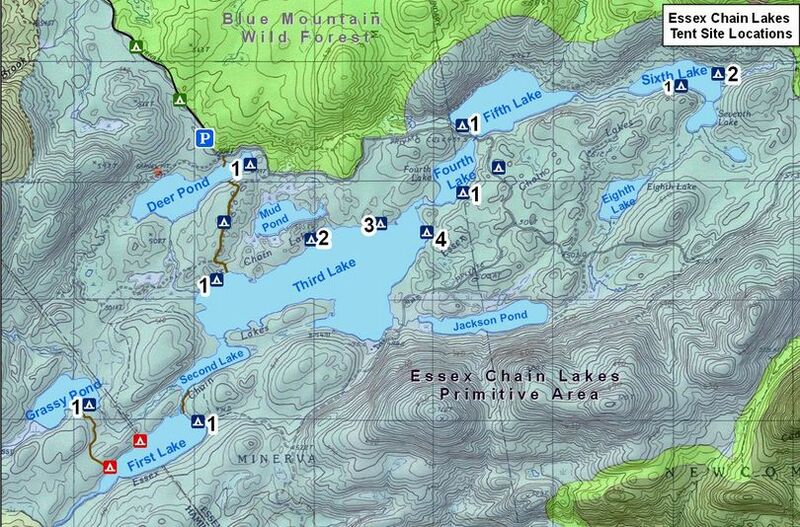 Paddlers can reach Sixth and Seventh Lake directly from Fifth Lake. We chose to camp at the only site on Fifth Lake assuming seclusion but were unaware of the dirt road passing behind the campsite. On our 1st day there were bikers and one lost hiker. The campsites were a little rough but the lake was pretty. Eric worked hard at fishing and was finally rewarded when Kathryn suggested he use pieces of hot dog near the downed tree. 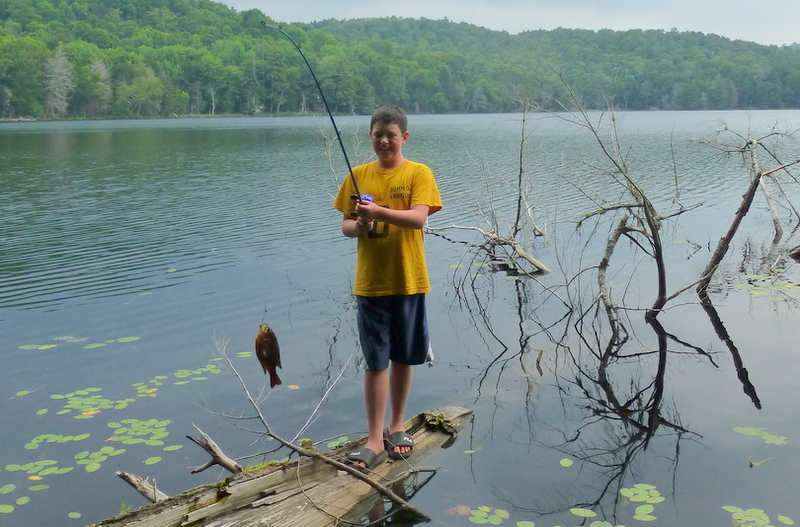 Eric caught 25+ sunfish and shiners (some possibly more than once). Kid fishing at it’s best. We toured Sixth and Seventh Lakes on Tuesday evening. Generally good weather, although rained one day. Bugs were not bad except for deer flies on the portage. We heard and saw lots of loons; swimming, fishing, flying from pond to pond and making defensive displays to distract Skip and Matt when they inadvertently got too close to a family unit. At least 5 of them swimming, dancing and flying past our campsite all the time. Very cool. Heard owls and various warblers. Because the campsite hadn’t had a lot of use (we think we were actually the first), no black bears in evidence. Leeches in the water were a deterrent to a lot of swimming, though we did swim some and the water was very warm. Kathryn doing a little tent house-keeping. After breakfast Wednesday morning Matt and Skip hiked out to the parking lot; Matt to return home and Skip to meet his brother-in-law, Steve. Skip and Steve paddled around the Chain of Lakes Rain. 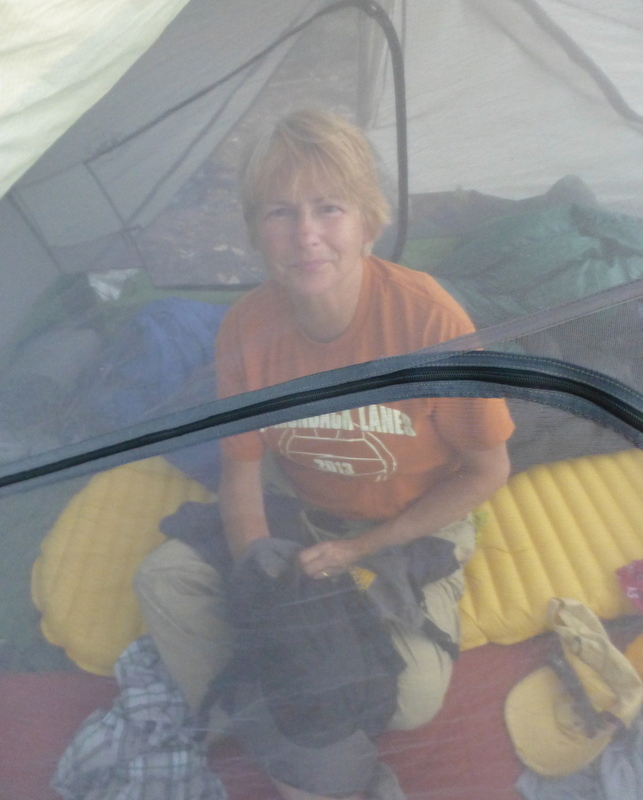 Mid-afternoon rain moved and we sat under the tarps and played cards and cooked our dinner of Mac & Cheese and hot dogs. The evening cleared out and the next morning displayed a clear and calm Fifth Lake. Thursday morning we opted to portage out along the road rather than paddling back to Third Lake. It took about 60 minutes of easy walking.